From the day she was born, Lena has viewed the world through the jagged window of a razor wired fence. The hundred acre property she shares with her mother in the Australian outback may keep her safe from the Y Carrier disease, but it is no longer enough to hold Lena’s interest, and her mother’s increasingly tight grip on her free will is stifling. Just as her curiosity blooms and her courage rises, she meets a boy through the fence, the first boy she has ever laid eyes on. His name is Patrick and he comes with a dangerous yet irresistible invitation of adventure beyond the fence, an invitation to which Lena cannot say no. Lena has lived her almost seventeen years behind the fence. With no human interaction, all she has now is her mother, after her cousin Alice was brutally murdered. Lena a can't remember a time where the world was safe from Carriers, the infected population of the country. A Carrier is male, presenting with rash type symptoms. But where males carry the virus, a female contracting the illness will die, so Lena's mother will stop at nothing to keep her safe. But like her cousin Alice, Lena longs to see beyond the fence, so when Patrick approaches from the outside, this may be Lena's one chance to see the world. Patrick is looking for his father, a man who went hunting only to never return. The seventeen year old boy is now left to provide for five other children alone. With her mother taking to the bottle and locking herself away, Lena and Patrick develop an easy friendship, despite Lena harbouring a secret that may tear the two lonely teens apart. While defying her mother, she scales the fence in search of Patrick and his home while Lena can't shake but feeling she's being watched. But it seems that there is a civilisation beyond the fence, when the two teens are captured and taken to what seems to be a civilian camp. The camp are preparing for war against an unknown enemy, waiting for an antidote to cure the Carriers the group hold captive. But as the enemy approaches, the desolate West Australian out back warriors will be no match for what they have in store. Carrier started brilliantly, the premise of a teen girl being confined to her home, a rampant virus killing the female population and the mystery of Patrick immersed me within the storyline. But sadly the final few short chapters felt as though the story was verging on the ridiculous. It left me feeling deflated, as though two different books had been merged together. I'm not generally big on criticism, but with a rewritten ending, a longer and more drawn out storyline, this book could easily be a five star read. 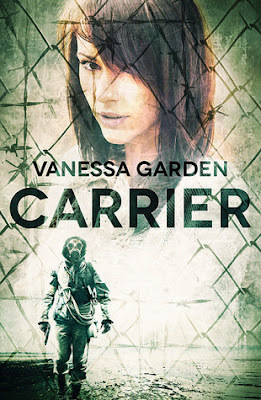 I really enjoyed Vanessa Garden's Captivate, and this one has the potential to surpass. I would love to see it further developed. But as is, I can't see too many readers appreciating the ending. Aw...it's always a shame when books are so "scrunched up" that you can't get that emotional connection out of them (same thing with books that are too long for their own good...those bother me too)! And the ending definitely doesn't sound like the book's strong point! It's worth the read Zoe, can't wait to see what you think of the ending. It really is so left of field, it's a shame because this had incredible potential. Thanks for stopping by Zoe. I couldn't agree more, the ending really sabotaged the rest of the storyline. Up until then, I was so immersed and was rwally enjoying it. Gah when it doesn't end well it feels like it was a waste of time to read! What a shame, thanks for sharing your thoughts on this. I think I'll avoid it. My thoughts exactly Jeann. Up until then, I absolutely loved it... Then I had to double check that the rest of the digital copy wasn't tampered with and the wrong ending was just shoved in. Nope, it really was that left of field. I really hope she reworks it, from the few reviews I've read since, quite a few readers have the same issue.